Have you considered starting a blog? 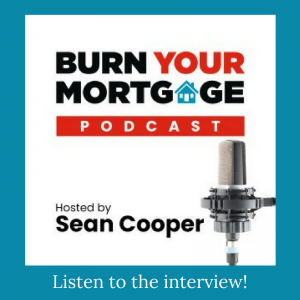 Are you looking to share your message with the world? The technical side of blogging is not for the faint of heart. 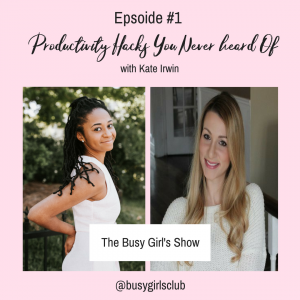 I’ve heard so many bloggers get discouraged by the overwhelm of getting a site up and running. 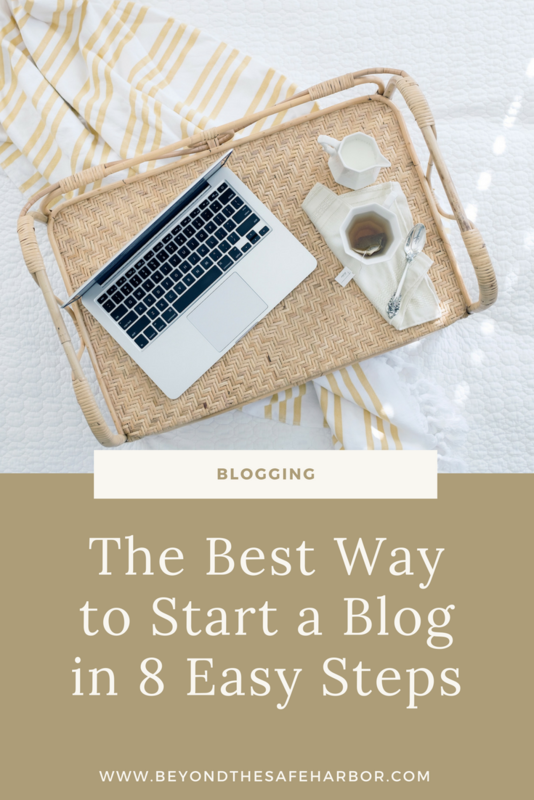 With that in mind, today I’ll be sharing the best way to start a blog with step-by-step instructions. Warning: this is a looooong post and for good reason: there’s a lot to cover! Bookmark it and revisit it again and again as you continue on your blogging journey. As I’ve said before, it’s critical to determine your objective when it comes to any side hustle. Are you looking for a hobby blog where you can post when the mood strikes you? Or are you looking to build a business that will ultimately replace your day job? How much time do you have to dedicate? And how serious are you about helping it grow? Answering these questions will help you get clear on how you approach starting a blog. The balance of this post assumes you are taking blogging at least somewhat seriously, as it guides you through the process of setting up a self-hosted blog (i.e. yourblogname.com) versus a hosted blog (i.e. yourblogname.wordpress.com). It gives you far more control and flexibility, looks more professional, and is easier to scale, among other benefits. For a detailed comparison of the differences between self-hosted and hosted, check out this article from WP Beginner. Choosing a niche is important, as, depending on your objective, you’ll be writing and sharing content in this area for years to come. I recommend watching my video on how to find your passion and doing some thinking and brainstorming about what inspires you, what you’re passionate about, and what you want to help others with. Once you’ve chosen a niche, come up with a blog name. Choose something catchy, easy to remember, and aligned with what your blog is about. Consider choosing a few back-up options in case your name is taken. Once you’ve chosen a blog name (and a few back-ups just in case! 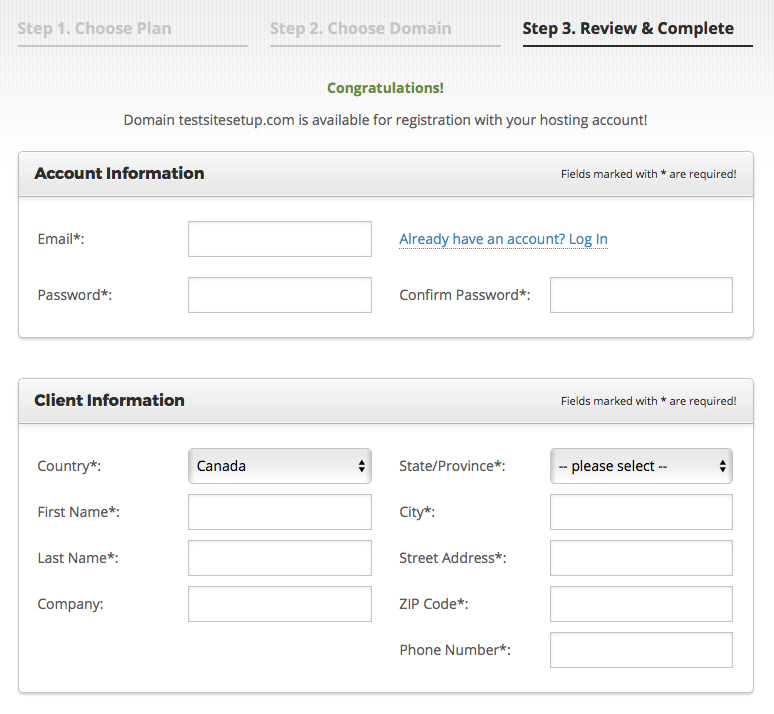 ), it’s time to register your domain name and sign up for hosting. Your domain is your site’s address or URL. It’s where your site operates and where it can be found on the internet. Website hosting, on the other hand, is sort of like your rent: monthly payments that enable you to operate at that address. While a domain registration is typically an annual payment, hosting is generally charged monthly but paid up front on an annual basis. While you can always buy a domain and hosting from different sources, I’ve found it to be easiest to have them with the same company. This prevents the few extra steps involved in pointing your hosting to an external domain, and just makes things a lot simpler for a newbie. This walk through will show you how to sign up for both a domain and hosting with the same provider. In this case, SiteGround. While I’ve used GoDaddy in the past, I’ve since switched to SiteGround and have been incredibly impressed with their customer service. The day I joined, I received a personal phone call from someone at SiteGround welcoming me to their services and asking if there was anything they could help me with. In the first few months, I used their Live Chat feature at least 10 times and always received quick responses from knowledgeable staff. They truly went above and beyond by providing me with guidance and links to aspects outside of their scope, like G Suite email questions. I’m a member of multiple blogger groups on Facebook, and consistently hear positive feedback from others about SiteGround as well. While GoDaddy and BlueHost are longstanding companies in the hosting world, it seems their customer service is lacking, sites go down more frequently, and they aren’t as reliable. SiteGround, on the other hand, is well-known for their customer focus and reliability. Once there, you’ll see a few options for hosting. This is because we’re going the route of getting both our domain and hosting from the same provider. We’ll cover the intricacies of setting up hosting in the next step. But for now, you’ll just need to choose a plan. I recommend signing up for the StartUp package (the one on the left), as it should cover everything you need if you’re new to blogging. And it’s also the cheapest! Click the “Get Started” button underneath it. You’ll be prompted to Register a New Domain or enter if you already have one. Assuming you don’t yet have a domain, keep the radio dial selecting “Register a New Domain” and enter your desired domain name. Since the “www.” and “.com” are already present, enter your site name, without spaces. For the sake of this walkthrough, we’ll set up a new domain. I’ve entered TestSiteSetup (exciting – I know!) Click “Proceed”. 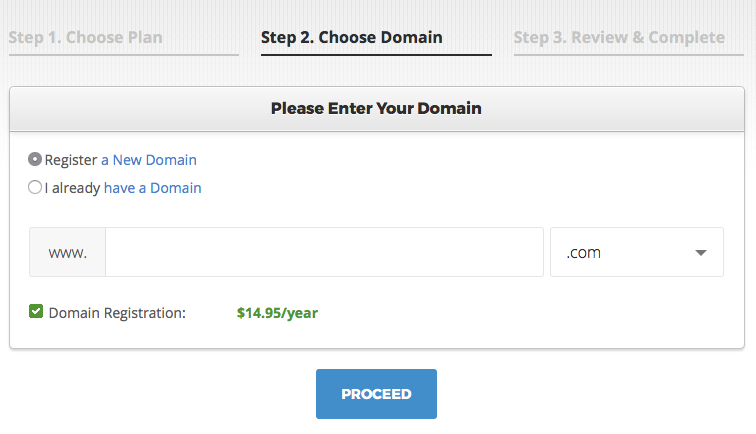 If your domain name isn’t available, SiteGround will let you know and you can choose another one. Next, enter your email, create a password, and fill out the Client Information section. Scroll down and enter your payment information. Scrolling down, you’ll see the Purchase Information section. Plan: This should reflect the plan you selected earlier. As I mentioned above, the StartUp plan is just fine. Data Center: This should automatically select the center closest to your location. Unless you’re using an IP address blocker or if the location seems way off, keep it as is. Period: 12 months is good, since it’s the shortest time commitment to secure the low $3.95USD/month price (on the StartUp plan). While you can opt for a one month trial, the best way to start a blog is to give it a shot for at least a year. And, the trial option charges you a total of $18.90USD for 1 month given the setup fee. It’s worth the up-front cost since the full year costs $47.40USD (about two and a half times that). 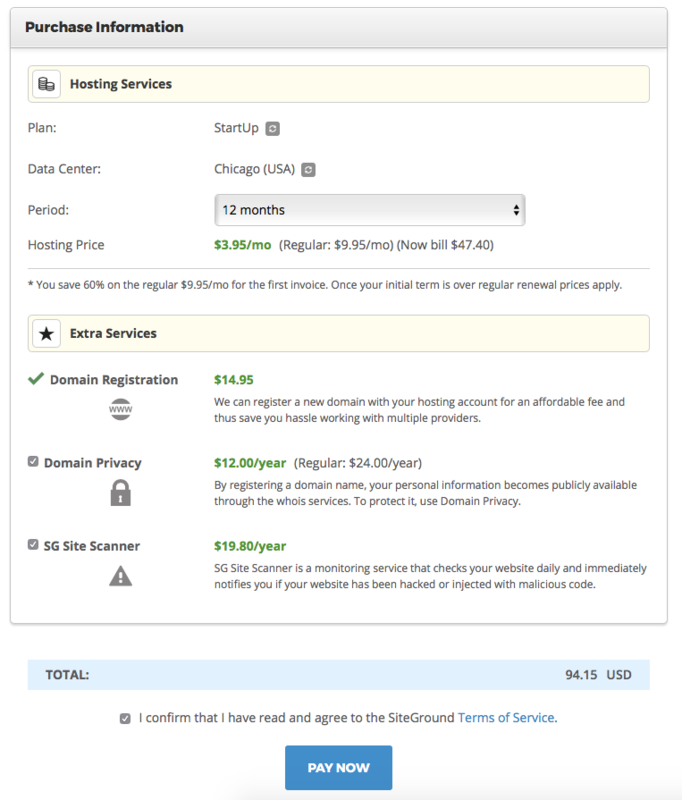 Hosting Price: This will automatically populate with your plan’s monthly price. Extra Services – Domain registration: As I mentioned, it’s much easier to have your domain and host provider be the same, and $14.95USD to register your domain is quite standard. Extra Services – Domain Privacy: I would highly suggest keeping this one checked. This protects your name and address from being publicly available to anyone who searches for your domain information. The $12USD per year fee is cheaper than I’ve seen with other hosts. Extra Services – SG Site Scanner: This is SiteGround‘s monitoring service that checks your site daily to ensure it hasn’t been hacked. I added this service since it seemed easier than figuring it out on my own. This one is up to you, though if you don’t select this service with SiteGround, I’d suggest investigating alternatives. Click “Pay Now”, and you’re all set! WordPress is completely free and is pretty easy to install. SiteGround even offers the SiteGround Wizard which pre-installs it on your site! Their full tutorial walks you through every step and even shows you how to install a free theme. If you have any trouble, just use the Live Chat function on the SiteGround website and someone on their team will be able to help you. When it comes to choosing a theme for your site, you have a few options. First, you can opt for a free theme. 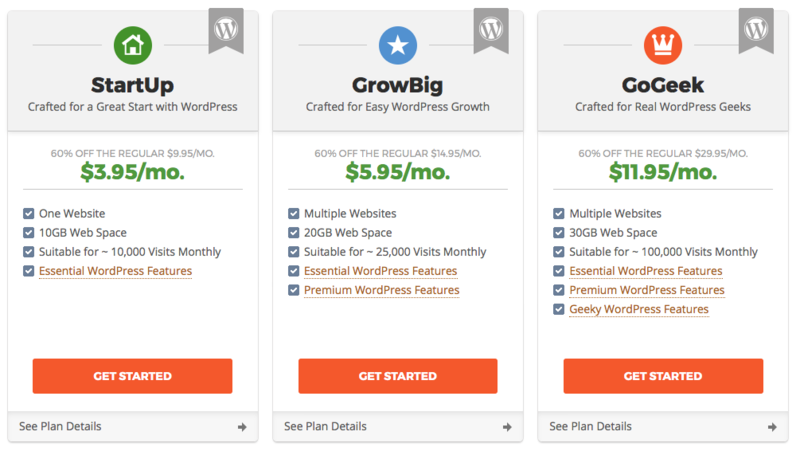 A bunch of free options come pre-loaded with WordPress, and you can also find free themes within the WordPress Dashboard. There are a ton of options, so try to narrow down your must-haves (sidebar? sticky navigation bar?) and let those guide you in choosing a theme that works. Third, you can purchase the Genesis Framework (parent) from StudioPress and then purchase a child theme to goes with it. (Since I’m no tech expert, the WP Beginner Article explaining this in more detail is a great place to start!) The Genesis Framework costs $60USD and a child theme can range in price, but often falls in the $30-80USD range. If you take this route and are looking for a feminine child theme that works with the Genesis Framework, I highly recommend Restored 316 Designs. I’m currently using their Refine Theme and love it! When it comes to logo design, you have many options. 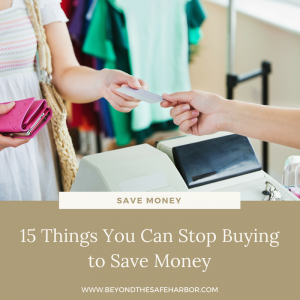 First, if you don’t have budget, you can design one yourself using PicMonkey, Canva, or even PowerPoint. Canva is my favourite of these options, as they have some beautiful templates to use for guidance and inspiration. Second, if you have a small budget, consider getting a logo made on Fiverr. I’ve purchased many “gigs” over the years and the value is excellent. Third, if you have a budget over $50USD, consider hiring a logo designer. I had mine designed by Laura from Pixel Me Designs, but there are loads of other options out there including 99designs, and Upwork. At this point, you should have everything up and running and can start to post. I’d highly recommend reading blogging-related books or taking courses at this stage. It will make a huge difference in your success, especially if you want to blog full-time. If you’re just starting out, I’d highly recommend signing up for a robust blogging course like Elite Blog Academy. I’m partway through it now, and it’s a fantastic foundation for any blogger. While it doesn’t get into the nitty gritty technical stuff, it guides you through the strategy of blogging. This includes identifying your target, creating great content, monetizing your site, and more. Enrolment only opens once a year, but you can sign up for the waiting list to be sure you don’t miss it! Ruth Soukup, the creator of Elite Blog Academy, has also written a book about blogging so you can grab How to Blog for Profit Without Selling Your Soul if you’re looking for something to tide you over until EBA opens! If you’re on a budget, I’d recommend buying Ruth’s book and checking out free blogging courses and resources. Pinterest is a great place to start, and I love WP Beginner for any WordPress questions I have. Whew – that was a lot of information! If you’re starting out blogging, CONGRATULATIONS! I wish you much success. Be sure to check out The Best Blogging Tools I Recommend for Beginners, 13 Free Blogging Tools Every Blogger Should Know About, as well as my blogging resources page that I’ll be updating regularly. Please leave me a comment below and let me know what your blog is and how I can help! I’d be happy to write more posts about blogging, especially as I continue my own journey. This is a really interesting article. Is it possible to make money off a free website made on weebly, for example? Or wix? Hi Blossom! Yes it is, though I’d recommend a paid, self-hosted blog if you’re looking to make it a longer term business. The link I shared about hosted vs. non-hosted includes some other considerations!